River dolphins share long thin rostrums, reduced eyes, numerous teeth in both upper and lower jaws, and somewhat flexible necks (Figure 1). These morphological characters prompted scientists to lump the five living species of river dolphins into a single family Platanistidae. However, with the advent of molecular data sets in recent years, that classification has changed. River dolphins are no longer considered a monophyletic group. Instead, the Indus and Ganges River dolphins (Platanista spp.) remain in the family Platanistidae, while the family Iniidae comprises the three remaining river dolphins; the Amazon River dolphin (Iniageoffrensis), the Chinese river dolphin (Lipotes vexillifer), and the La Plata River dolphin (Pontoporia blainvillei). Of these, the La Plata River dolphin is not a freshwater specialist. They prefer the salty waters of coastal rivers and estuaries. Sadly, the Chinese river dolphin is now considered extinct in the wild (it has not been sighted since 2004). What continues to puzzle scientists is the far-flung distribution of river dolphins. How did they come to inhabit these distant rivers. A partial answer to this puzzle appears in a recent paper on cetacean phylogeny (Geisler et al. 2011). 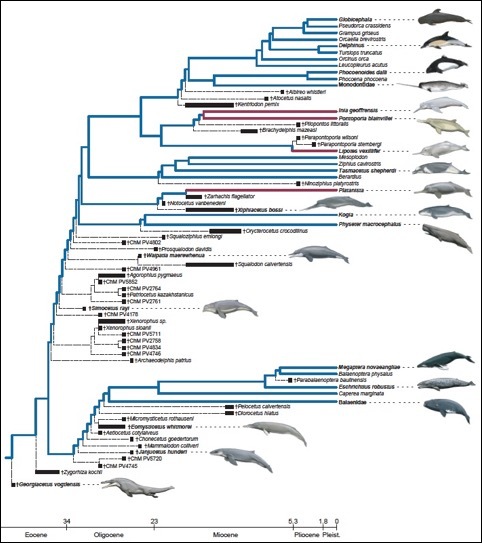 While this paper presents a detailed phylogeny for all Cetacea based on a combination of genomic, morphological, and fossil data (Figure 2), it also uses this phylogeny to provide preliminary tests of some of the hypotheses of river dolphin evolution. One explanation is that the ancestors of living river dolphins were coastal marine species that were stranded in far-flung river systems as Cenozoic sea levels dropped. This hypothesis suggests that tolerance of freshwater (and intolerance of saltwater) evolved at least three times. The data presented by Geisler et al., 2011 support this view. Characters such as numerous teeth, long narrow rostrums, and elongate mandibular symphyses were thought to be convergent adaptations allowing efficient prey capture in riverine systems (i.e. raptorial feeding). 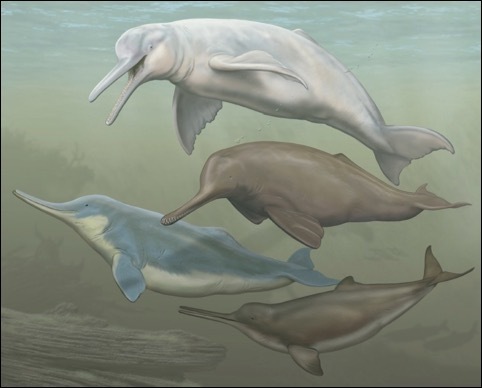 However, the authors point out that, “there is no reason to think raptorial feeding is more efficient in rivers than in the ocean.” Furthermore, placing these morphological characters on the consensus tree, which includes fossil species, reveals that the paleoenvironments of extinct river dolphins were likely marine (Figure 3). For example, the fossil species ancestral to living Platanista and the ancestors of both Lipotes andInia were marine forms. These fossils already had long mandibular symphyses and other characters considered part of the raptorial suite. Thus, it is unlikely that the anatomical traits associated with prey capture in river dolphins are adaptations to freshwater environments. Rather than being convergent adaptations to raptorial feeding in freshwater, the supermatrix phylogeny provided by Geisler and colleagues (2011) reveals that many of the morphological characters shared by extant river dolphins were already present in their marine ancestors prior to entry into freshwater environments.